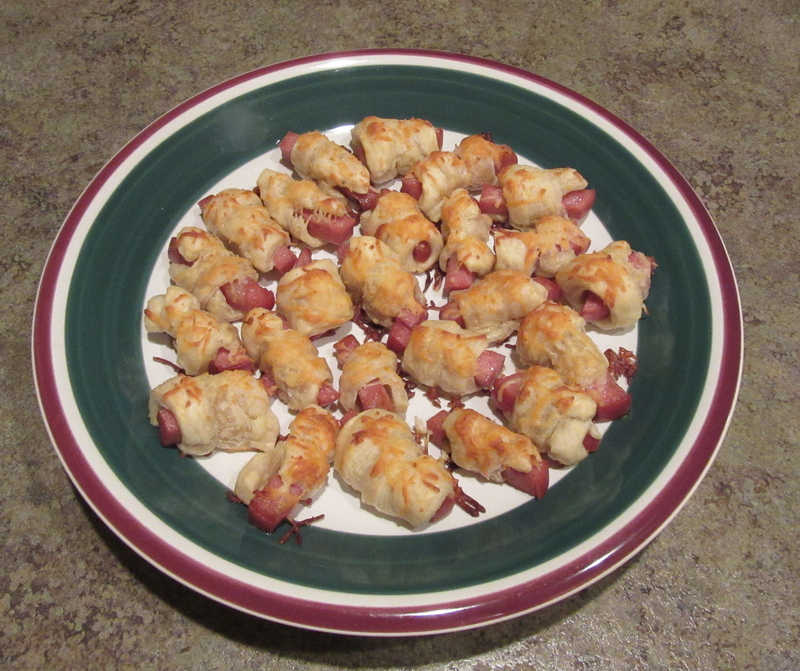 Mortadella Bites: To make 24 of these cute, different and yummy pigs in the blanket, you will need the deli to slice you 2 slices of Mortadella about 1/2 inches thick. When home you will need to cut each slice into 12 smaller pieces. Roll out one sheet of thawed puff pastry. Roll out just enough to flatten out a bit. Make 24 long slices of pastry and wrap each piece of Mortadella with a slice of pastry. Make sure the meat sticks out a bit on each end. Lay seam side down onto a parchment lined bake sheet. Brush the tops of each with egg wash. Sprinkle on top a bit of shredded cheese. Gruyere or swiss or maybe the Italian cheese blend that is shredded in the package. Bake 375 for about 20-25 minutes until golden. Platter up and serve some mustards on the side for dipping. I got this recipe from: Giada at Home. These are wonderful. And I will be making them again. I set out a little bowl of 2 different mustards and they were Yummy. Enjoy the recipe and enjoy your day. This entry was posted in Family, Food, football, Home, Recipe, snacks, special days, sports and tagged appetizers, celebrations, cooking, entertaining, food, game day food, Giada at Home, holiday, holidays, Home, kids, meals, parties, party, pigs in a blanket, recipe, shopworndesigns, Special Days, super bowl, superbowl food, tailgating, tapas by shopworndesigns. Bookmark the permalink.